The President of the United States is the top office in the country. 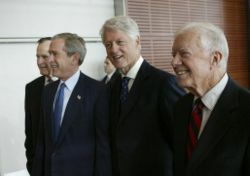 These men have led the nation through wars, tough economic times, good times, natural disasters, and more. You can learn about each one in the biographies below. Pick the US President below to view their biography. Go here to learn more about the office of President and the Executive Branch of the US Government. Go here for President Fun Facts. Try our US Presidents Crossword Puzzle or word search.